Mahmoud Abbas has sent Palestinian hopes soaring. His plans of asking for membership of the United Nations for his yet undefined country has obviously, and for all the right reasons, cheered not only his people but also been perceived as a courageous and decisive move towards ensuring freedom for his nation. There is little question that the Palestinian issue has consistently been observed in terms of legality, which is as much as to suggest that the Palestinians are entitled to a state of their own, to an ethos which will place them in the councils of the world in full measure. That is the legality behind the issue. And it is there because of what the Palestinians have lost in the course of modern history. Losing a country, losing a heritage is forever a wrenching affair; and yet that is precisely what came to afflict the Palestinians in May 1948 through the creation of Israel. You could safely argue that Palestinian legitimacy was buried under a weighty Zionist illegitimacy in that year. It was illegitimacy which gained fresh fury and strength through the Six-Day War of June 1967 when the Israeli army occupied the West Bank. When that happened, something of audacity came to be added to illegitimacy when Israel's rulers made it known that Jerusalem would henceforth be the capital of their state. No more would the ancient city be home, in that biblical sense, to divergent faiths but would be part of Israel. 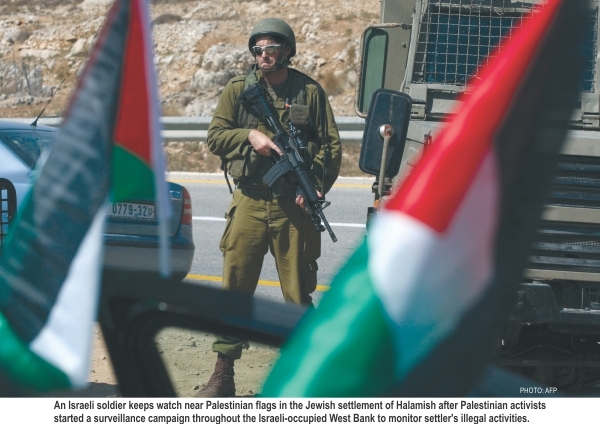 It mattered little that the Israelis were an occupation force. What did matter was that they felt happier annexing territory not their own. 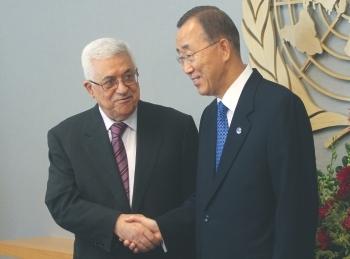 Palestinian President Mahmoud Abbas (L) is greeted by United Nations Secretary-General Ban Ki-moon at the UN headquarters. Which is when you understand the nature of the long Palestinian struggle against occupation. Gaza and the West Bank, after June 1967, turned into symbols of a future Palestinian state. There was Fatah with its intent to wage battle against the Israelis. To be sure, successive Israeli politicians and their friends in the West have all too easily dismissed Fatah and other resistance organisations as being but another name for terrorism. And then Fatah, with Yasser Arafat at its head, moved, slightly. It was, given the realities of today, a shift that ought to have produced some of the more historic results in terms of an inauguration of a new era. Arafat made peace with Yitzhak Rabin and Shimon Peres, nearly convinced that things were on the right track. They were not, as subsequent developments were to show. Successive Israeli administrations — and you can certainly trace them all the way back to the Menachem Begin era — carefully nurtured a policy of keeping Palestinian statehood at bay. The Israeli administration under the hardliner Binyamin Netanyahu has now made it known that everything will be done to prevent Palestine being given a place at the United Nations. He may have a point, which again is essentially symbolic of Israeli obscurantism. It is that without a formal state structure to back them up, the Palestinians do not in the legal sense hold any right to membership of the global body. But then, there is that essential element of morality too that one cannot quite ignore about Palestine. Think here of Palestine being a metaphor for everything that has been lost and all that may yet be reclaimed. The old homes, the orchards that bore fruit over generations, the hills and valleys which shaped the lyrics of unsurpassable melody passed under Israeli control long ago. Ask Netanyahu. He will not let go of that Palestinian pride, much as his predecessors would not agree to a restoration of their ancestors' homes to today's Palestinians. You have here a condition where a state has taken birth through means patently illegal. And you have too the unambiguous immorality of that state extending its reach through taking and keeping what is not its own. It is this deep-rooted injustice Netanyahu means to reassert at the United Nations. He has friends to back him up. If you ever had any illusions about Barack Obama being emblematic of truth and historicity, now is the time for you to change course. Obama cannot wean himself away from Israel just as those who came to the White House before him could not. His administration, like Israel's, is now scrambling to have Palestine denied the dignity and formality of statehood at the world body. There is the insidious veto to stop Mahmoud Abbas dead in his tracks. And there is that certain odour of malevolence in the air. There is talk of peace in the Middle East, of how the Palestinians might ruin the chances of a settlement descending on the region if they try having things their own way. But you know such conclusions are plain nonsense. States which commandeer territory belonging to other nations and unashamedly hold on to it engage in brigandage. That is what the Israelis have been doing. To our regret, it is Obama's America which is keen on covering the backs of these brigands. And yet the dream of Palestine needs to endure. Because history is bigger than men of Machiavellian ambitions, on a higher pedestal than parochial politics, Palestine remains a necessarily historical struggle in defence of the rights of man.